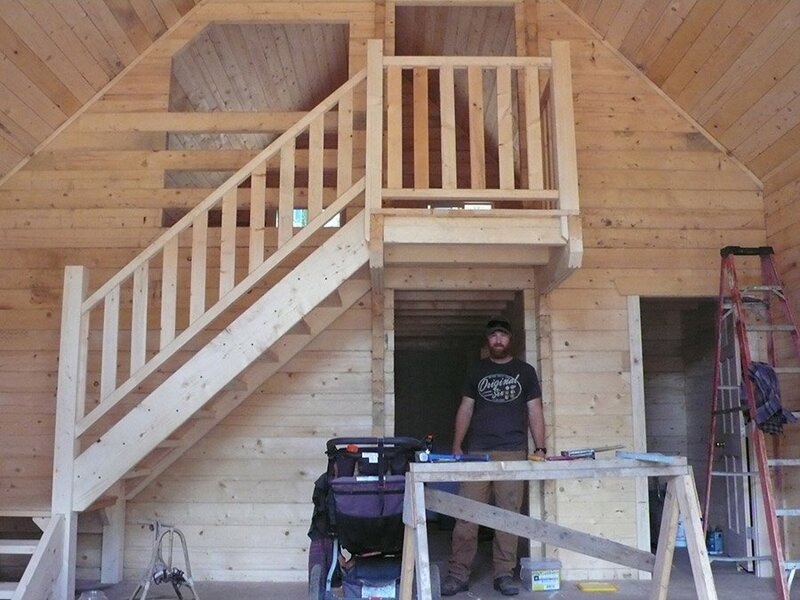 We offer log cabins from about 200 to 1,000 square feet (and bigger if the design allows), with or without a loft. 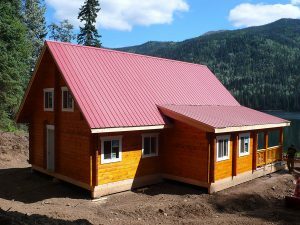 Depending if a building permit is needed or not, we can sell our cabins either as a log frame only, or complete with the roof system and doors and windows. 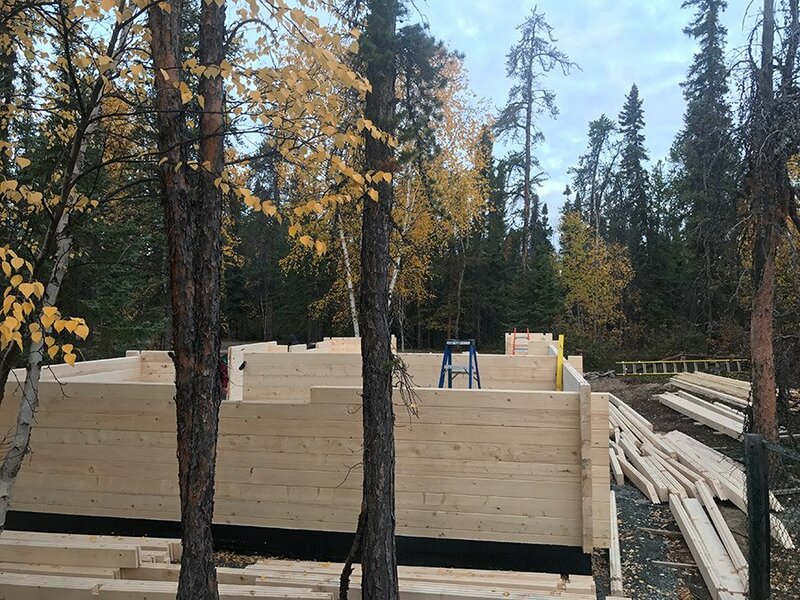 Our log cabins are constructed with saddle notch corner connections. 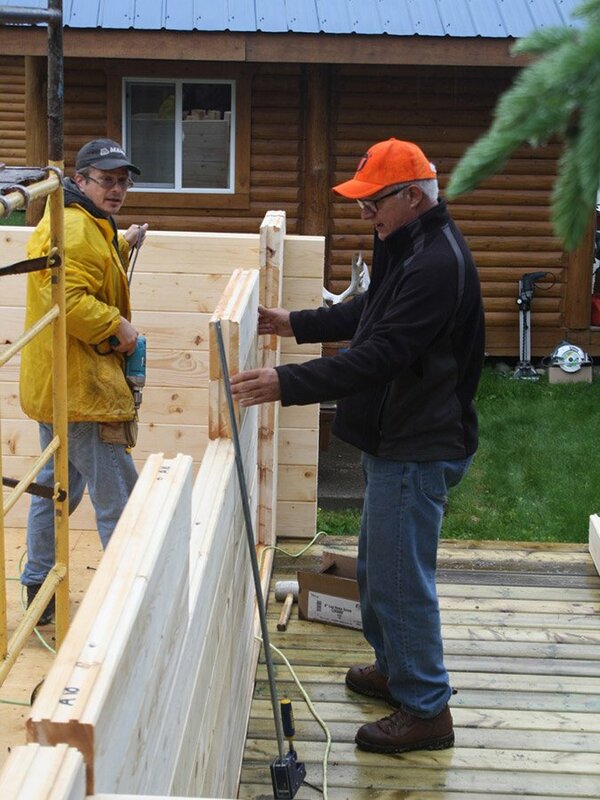 The cabins are built from seasoned 3+1/8”x 6¼” milled double tongue & groove (t&g) spruce logs. 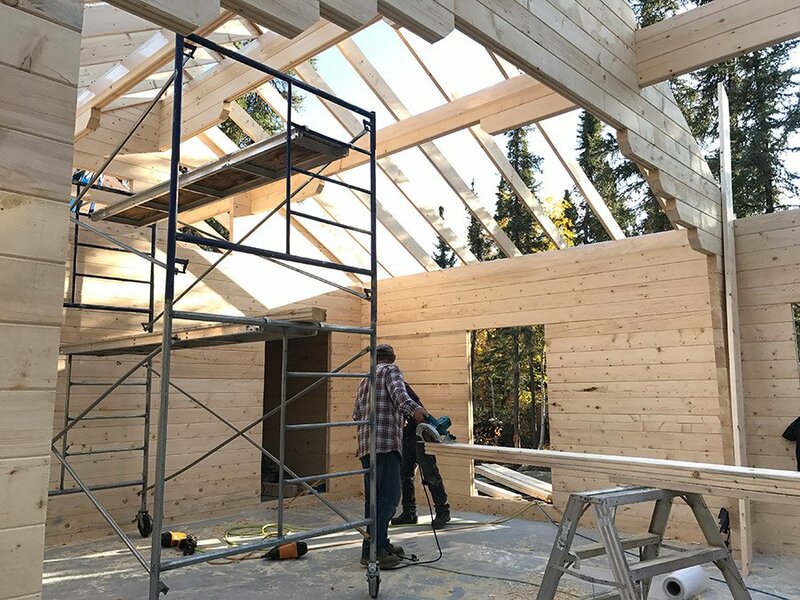 The saddle notches are cut with our Kruesi log notching machine, which ensures a precise and tight fit for every connection. 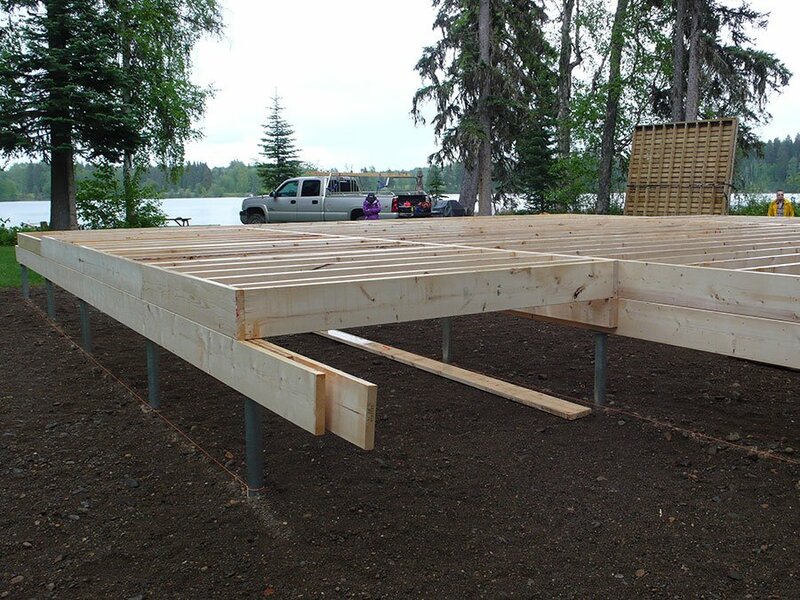 Each log row is securely fastened with special Oly log screws. 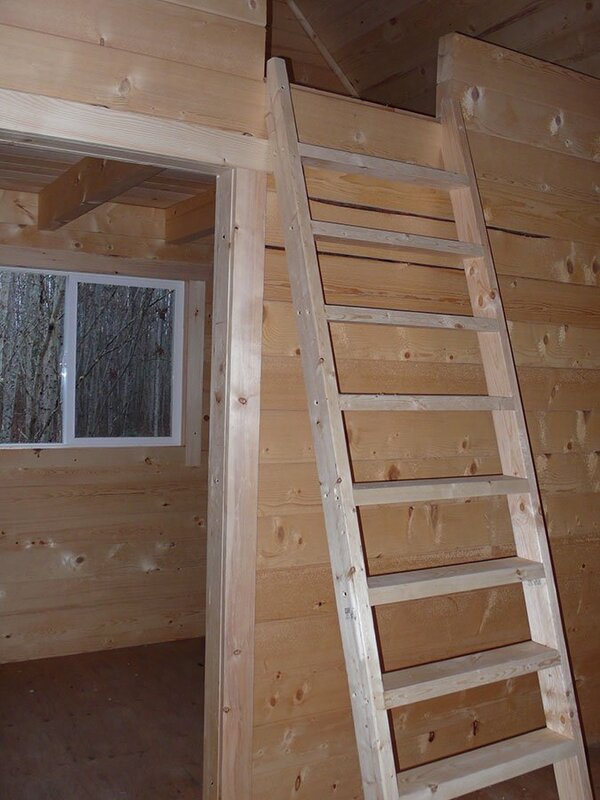 The cabins with a loft do either have a log stair case or a log ladder. The timber joists for the loft are usually 3 ¼” x 6 ½” beams with engineered dovetails to carry high loads.The floor boards for the loft are either 2×6 or 2×8 t&g boards, which gives the ceiling underneath a nice finish.Door and window cutouts are all routed out to fit a 1”x 1” board for stiffening up the openings. 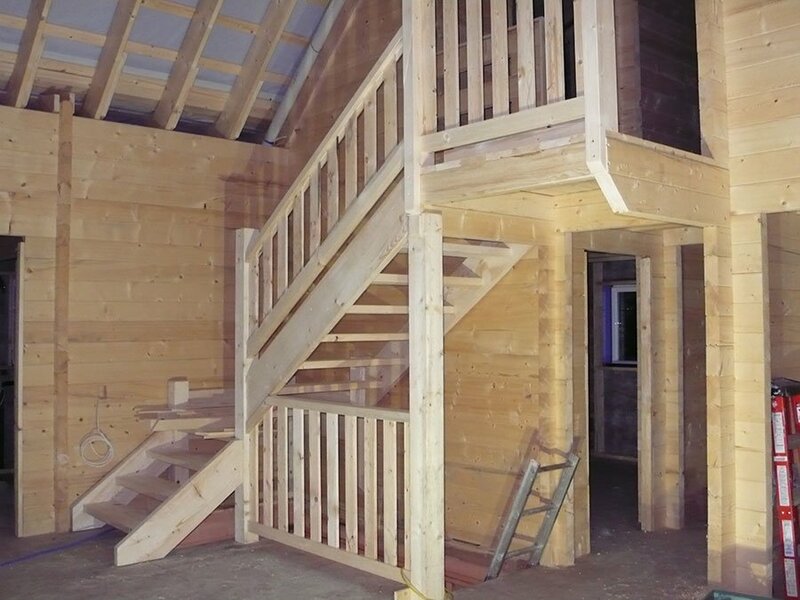 Depending on the location and climate of the building site, we offer different insulation values for the roof system. 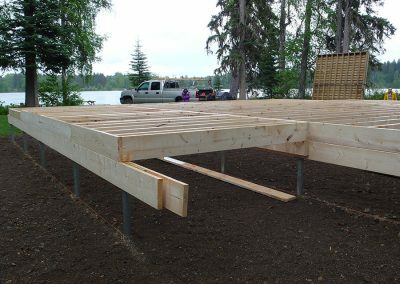 Usually we use 2”x 6” rafters with an R-14 insulation value for our 12’ to 14’ wide cabins, 2”x8” rafters for the up to 18’ wide cabins, and 2”x10” rafters for our bigger ones with an R-22 to R-28 insulation value. 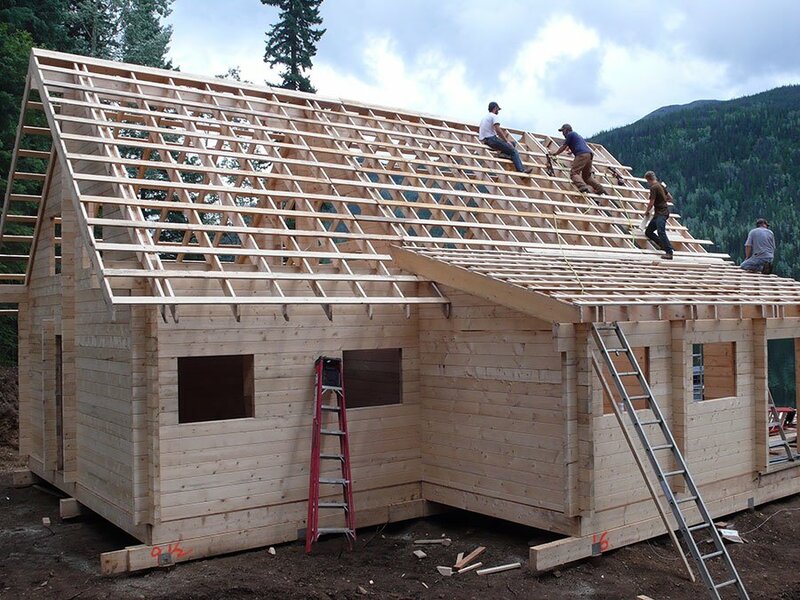 A 2”x12” rafter system with an R-44 value is available upon request. 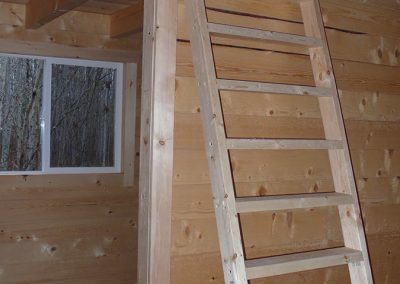 For the inside ceiling the choice is between 1”x 6” t&g boards or 3/8” plywood, which is the more economical option. 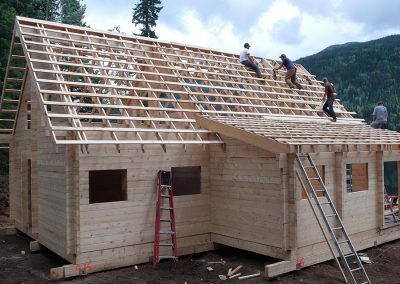 The roofing material is sheet metal, which is available in many different colors. 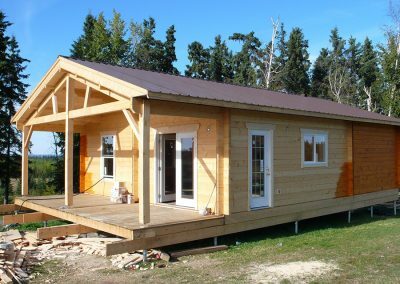 *The roof system and doors and windows are only available for recreational cabins without a building permit. 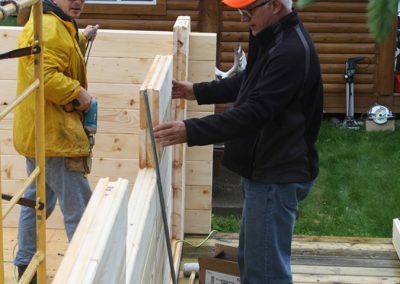 Steel insulated man doors are used for the exterior and pine doors for the interior. Windows are double pane vinyl sliding windows with mosquito screen. 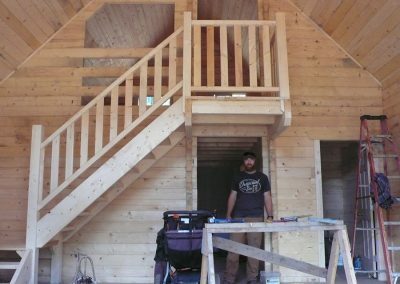 Doors and windows come with inside wood frames and outside trim. 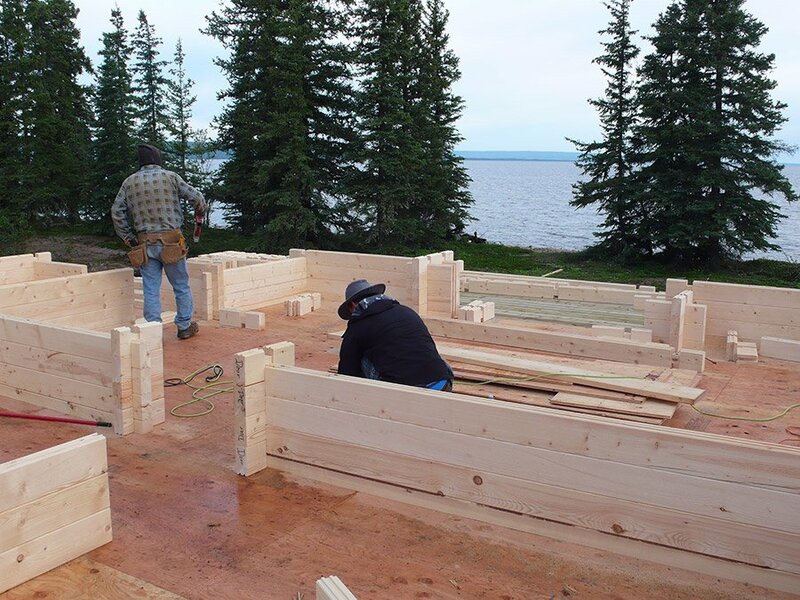 We can provide detailed plans for the foundation, which can be pillars, sonar tubes, metal screw posts or a foundation with footings, but only for cabins without a building permit. 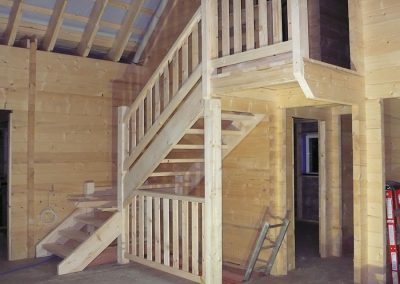 We can provide detailed plans for the layout of the beams that carry the floor joists, and plans for layout of the joists. We can deliver the wood floor for our smaller cabins and install it with the customers help. 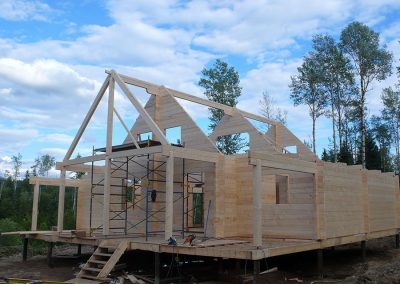 The assembly of a cabin takes about 3 – 11 days, depending on the size. 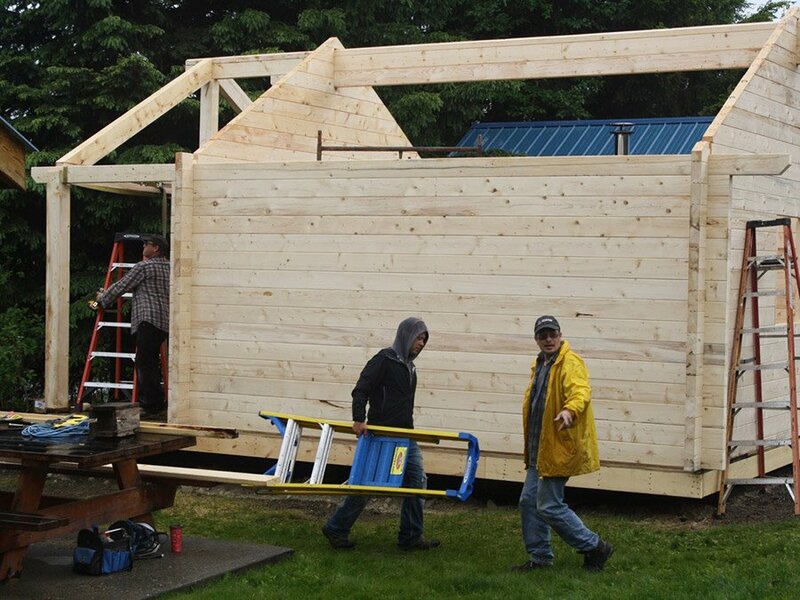 We offer the setup with our crew, in cooperation with local help, provided by the customer. 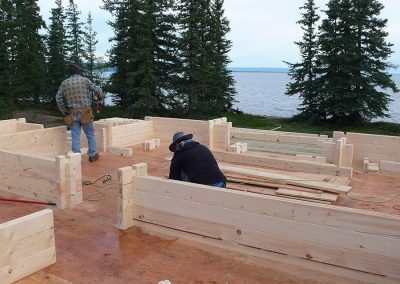 Delivery is available in northwestern Canada. Please inquire about our rates. All other destinations require a shipping company and rates are available upon request. Turnaround time is approx. 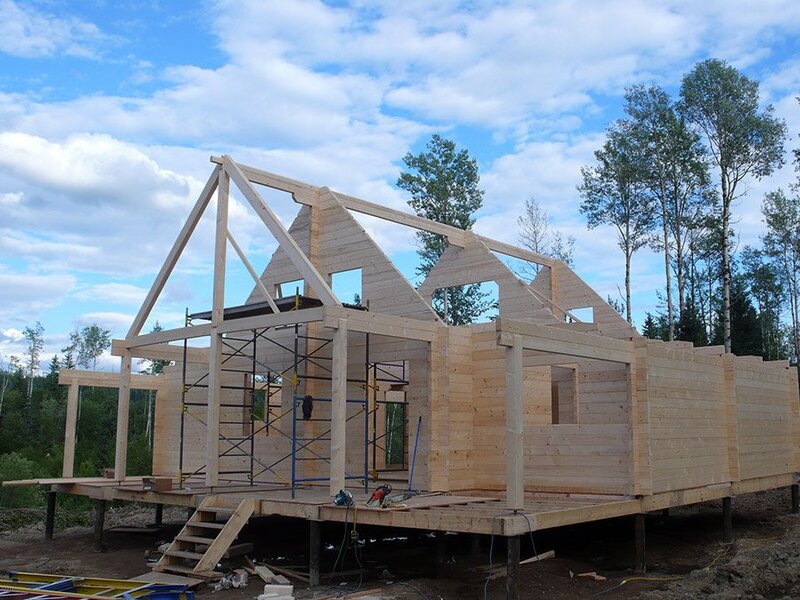 7 – 12 weeks from the day of order and received deposit, depending on already confirmed orders. 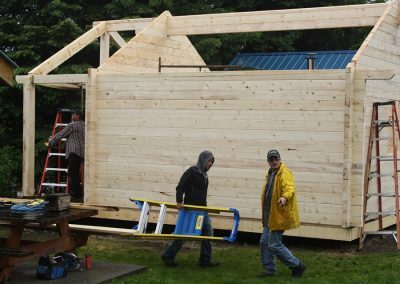 Information is available from the Regional District you are planning to build in. 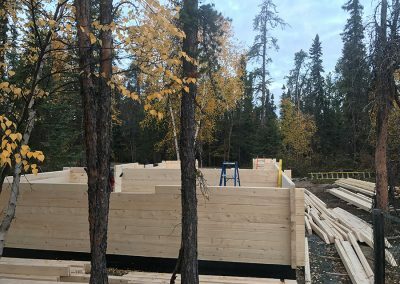 If a building permit is needed, we can only build and setup the log frame, and supply the t&g boards for the insulated log wall system for the outside wall to meet the required R value.